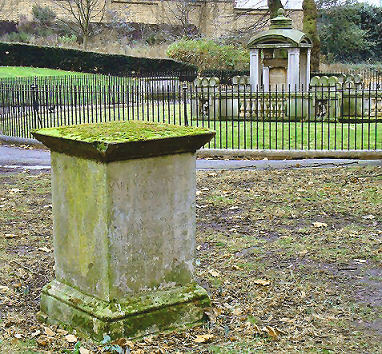 When and Where was Mary Wollstonecraft Born? 27th April 1759, Spitalfields, London, England. Mary Wollstonecraft came from family of seven children. She had three sisters and three brothers. She was the granddaughter of a wealthy manufacturer who worked in Spitalfields, London. Her father, Edward John Wollstonecraft, originally a handkerchief weaver, spent the fortune on a series of unsuccessful farm businesses trying to establish himself as a gentleman farmer. He was also fond of a drink and was prone to beat his wife Elizabeth Dixon. Local day schools in Beverley, Yorkshire. 1761: Birth of her brother Henry Woodstock Wollstonecraft. 1763: Birth of her sister Elizabeth known as Eliza. Moves to Epping Forest with her family. 1765: Birth of her sister Everina known as Averina. At the death of her grandfather her father inherits some of his estate and the family again move on, this time to Barking. 1768: Birth of her brother James. The family moves on to Beverley in Yorkshire in October and Mary becomes friends with Jane Arden. 1770: Birth of her brother Charles. 1774: The family moves to Hoxton in North London. Mary Wollstonecraft meets Mr and Mrs Clare, who allow her into their home and begin to provide her with an education. She meets Fanny Blood for the first time at the Clares. 1776: The family moves to Laugharne in South Wales. 1777: The family moves to Walworth in London. 1778: Mary Wollstonecraft gets her first employment as a lady’s companion to Mrs Sarah Dawson in Bath and Windsor. The relationship between the two women was difficult. 1780: The family and younger children move to Enfield. 1781: Mary moves back home to nurse her sick mother in the autumn. 1782: Death of her mother on 19th April. Her father remarries and moves to Wales. In October Mary moves in with Fanny Blood and her family at Walham Green as a ladies companion. This is the time that her vision of a feminist utopia took shape as she began to idealise Fanny. Her sister Eliza marries on 20th October. 1783: Eliza gives birth to a child and develops post natal depression. 1784: Mary Wollstonecraft moves in with her sister Eliza after convincing her to leave her violent husband. 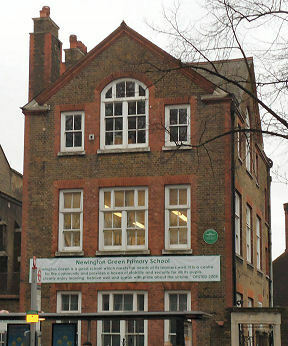 Mary and Eliza set up a school together in Newington Green with the help of Fanny Blood. She made friends with Richard Price a Minister at the local Dissenting Chapel who along with his friend Joseph Priestley was the leader of a group of people called the Rational Dissenters. 1785: Fanny Blood marries Hugh Skeys in Lisbon. Mary leaves the school and goes to Portugal to help Fanny Blood with her childbirth who went to Europe initially to improve her health. Fanny dies later in the year of consumption. Mary Wollstonecraft returns to London in December. 1786: The school at Newington Green closes due to lack of finance. In August Mary goes to work as a governess to the Anglo-Irish Lord and Lady Kingsborough in County Cork in Ireland. Her relationship with Lady Kingsborough was also strained but the children thought of her as an inspirational teacher. Frustrated by the life in Ireland she decides to become an author. Wollstonecraft begins work on her book on the conduct of children, “Thoughts on the Education of Daughters”. 1787: Mary Wollstonecraft accompanies the Kingsborough family to Bristol where she writes her first novel, “Mary: A Fiction”, and the short work “Cave of Fancy”. She is dismissed by the Kinsborough’s in August. She then moves to London where she takes up work as a translator with the assistance of the liberal publisher Joseph Johnson whom she had met via her radical friend Richard Price. She lives at 49 George Street, Blackfriars, London and works as a reviewer for Johnson’s “Analytical Review”. She meets influential people at this time such as the artist and writer Henry Fuseli, the writer Anna Laetitia Barbauld and the political reformer Thomas Holcroft. 1788: In May the Analytical Review begins publication and during the year prints Wollstonecraft’s first novel,” Mary: A Fiction”, her children’s book “Original Stories from Real Life” and her translation of “Of the Importance of Religious Opinions” by Jacques Necker. 1789: Mary Wollstonecraft’s anthology, “The Female Reader” is published by Johnson under the pseudonym of Mr Cresswick. She begins to be romantically attached with Henry Fuseli. 1790: Mary’s translations of Christian Gotthilf Salzmann’s “Elements of Morality” and “Young Grandison” by Maria Geertruida van de Werken de Cambon are published by Johnson. The former is illustrated by William Blake. In November she publishes “A Vindication of the Rights of Man” anonymously at first and then under her own name on 18th December as she was upset by the attacks on her friend Richard Price by Edmund Burke. Mary temporarily adopts Ann a seven-year-old relative Fanny Blood’s husband Hugh. 1791: Mary Wollstonecraft moves to Store Street. In September the second edition of “Original Stories from Real Life”, illustrated by William Blake is published. She also begins writing “A Vindication of the Rights of Woman”. She first meets William Godwin at a dinner in November held by Johnson where Tom Paine was speaking. Godwin was disappointed with Mary as she spent to whole time criticising Paine. At this time Mary was still infatuated with the artist Henry Fuseli despite the fact that he was already married. She was excited by his genius and actually proposed a platonic arrangement where she would live with Fuseli and his wife and travel to France. Fuseli’s wife was understandably upset and the artist ended their relationship the following year. She sits for a portrait by John Opie, which is now held by the Tate Gallery. 1792: In January “A Vindication of the Rights of Woman” is published which Mary dedicates to the French Statesman Tallyrand. In August Mary and Johnson set out for France but only get as far as Dover. In December Mary goes to Paris alone this time and meets Thomas Paine. She looked for other British people and joined a circle, which included the writer Helen Maria Williams. 1793: In April Mary Wollstonecraft meets the American timber merchant Gilbert Imlay in Paris. She falls in love with him and registers as his wife at the American Embassy for protection against imprisonment during the Terror although Imlay had refused to actually marry her. In June she moves to Neuilly-sur-Seine to escape the violence but returns to Paris in September when she realises she is pregnant. 1794: In January Mary moves to Le Havre and writes “An Historical and Moral View of the French Revolution”. Imlay says he will follow her but doesn’t which convinces her he is now bored with her. Mary gives birth to Imlay’s daughter Frances (Fanny) on 14 May. Imlay returns to England, leaving Mary alone with her new daughter. “An Historical View” is published in London in December. 1795: In April Mary Wollstonecraft returns to England to try and find Imlay but is rejected by him. She goes to live in Charlotte Street, London and makes an unsuccessful attempt at suicide in May realising that Imlay already has a mistress. She is saved by Imlay. In June she goes to Scandinavia with her maid and Fanny to do some business for Imlay in a desperate attempt to win him back. She returns again to London in September. In October she makes a second attempt at suicide by jumping off Putney Bridge into the River Thames but is rescued by strangers. 1796: In April she sees Godwin again and on the 21st August begins a full blown relationship. He had been impressed by her passion in her “Letters Written during a Short Residence in Sweden, Norway, and Denmark” about her love for Imlay. She starts to write “Maria: or The Wrongs of Woman”. 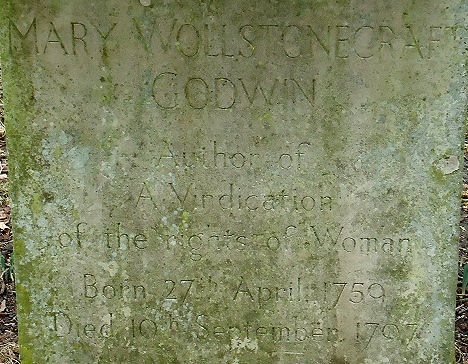 1797: Mary Wollstonecraft Marries William Godwin on 29th March at St Pancras Old Church. The couple move into 29 The Polygon, Somers Town, London which were actually two adjoining houses, so that they could still be independent. They had decided to get married to make the new baby legitimate but it made their friends aware that she had not been married to Imlay and many now shunned them. Godwin was further criticised as he had already advocated the abolition of marriage in his philosophical treatise “Political Justice”. John Opie paints the famous portrait of Mary Wollstonecraft, which is now in the National Portrait Gallery. On the 30th August Mary gives birth to a daughter, also called Mary (later to become Mary Shelley). The placenta broke during delivery and Mary became infected which puerperal fever. She survived several days in agony until she actually died on 10 September of septicaemia. (1798): William Godwin published his “Posthumous Works of the Author of a Vindication of the Rights of Woman” and his “Memoirs of the Author of A Vindication of the Rights of Woman”. He felt he was honouring his wife’s memory with love but many readers were shocked at the story of illegitimate children, love affairs, and suicide and her reputation went into the decline for the next forty years or more. 1786: “Thoughts on the Education of Daughters”. 1788: “Mary – A Fiction”, “Original Stories from Real Life Conversations Calculated to regulate the Affections and Form the Mind of Truth and Goodness” (Children’s Book). 1789: “The Female Reader”. “Miscellaneous Pieces for the Improvement of Young Women”. 1790: “The Rights of Men”. 1792: “A Vindication of the Rights of Women”. 1794: “An Historical and Moral View of the Origin and Progress of the French Revolution. 1797: “On Poetry”, “Our Relish for the Beauties of Nature”. (1798): “Memoirs of the Author of a Vindication of the Rights of Woman” and “Posthumous Works” both published by Godwin. 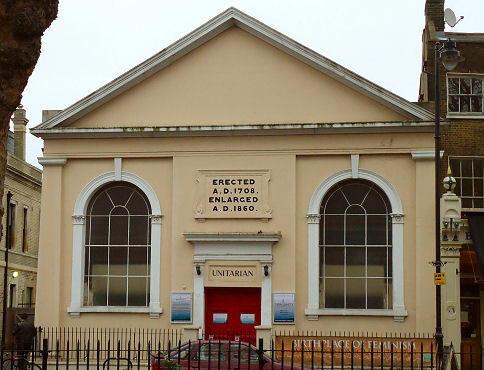 29th March 1797 to William Godwin at St. Pancras Old Church, London. 10th September 1797, London, England of puerperal fever and septicaemia caused by a breakage in the placenta after the birth of her daughter Mary. Originally buried in St Pancras Old Churchyard but was re-interred in 1851 by her grandson Percy Florence Shelley in St. Peter’s Churchyard, Bournemouth, Dorset, England with Husband William Godwin and next to Daughter Mary Shelley. The Women’s Library, Old Castle Street, E1 7NT. 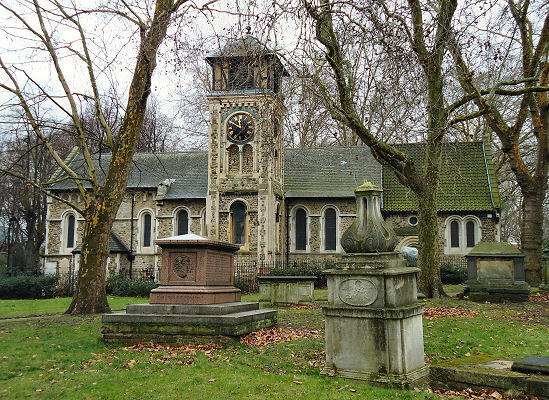 St Pancras Old Church and gardens.